Share your experiences with Model 3? Tesla is expected to offer Model 3 in two different variants- a 354 km range with 0-100 kmph in 5.6 seconds and long 500 km range with 0-100 kmph in 5.1 seconds. Tesla model 3 is an all-electric sedan and expected to make its Indian debut at an estimated price of Rs 48-50 lakh in the late 2018. Model 3 has got the style attributes from its ancestors- the model S, the model X, and the Roadster. Among the design highlights, the upturned snout, tall roof, and the bobbed rear of Model 3 stand out from the rest. 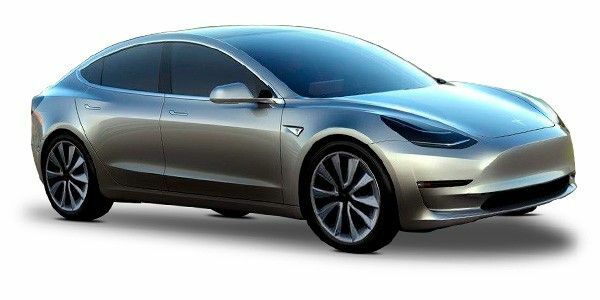 Tesla is expected to offer Model 3 in two different variants- a 354 km range with 0-100 kmph in 5.6 seconds and long 500 km range with 0-100 kmph in 5.1 seconds. Both of these variants will be available with one electric motor driving the rear wheels of the car. The interiors of model 3 are equally radical with a large touchscreen virtually hosting all the functions of the car- from speedometer to driver information and from entertainment and connectivity to HVAC controls. Tesla’s car for the masses looks like the Model S on a diet. From the rear and the side, the Model 3 looks remarkably like its bigger sibling with a tall roof line and chopped overall length. However, the Model 3 carries a different face, with its bland upturned beak that reminds us of the original Tesla Roadster and also the current Model X. The all-glass roof, which blends seamlessly into the rear end of the saloon, makes it look more like a coupe than a sedan. The standard 18-inch wheels work well with the overall styling quotient but for an additional fee, Tesla will offer 19-inchers as well. The minimalistic design approach continues on the inside as well. Apart from the dash-mounted 15.4-inch touchscreen display with its landscape orientation, nothing else demands attention in the cabin. That display controls everything from the dual zone climate control, sat-nav to the sound system while displaying information regarding battery charge, usage and range. Oh, there is no dedicated instrument cluster, so the driver centric information like the odometer and speedometer is also fed through the same display. Because of the shorter length than the Model S, there isn’t enough room to mount two extra seats in the rear trunk. But the 60/40 split folding rear seats add to the versatility factor. There are two battery packs to choose from - 50 kWh and 75 kWh. The smaller of the two is good for a 350km range on full charge and can hit 100kmph from a standstill in 5.6 seconds. Top speed is rated at 210kmph. With a supercharger installed, the battery can be juiced up to give a range of 210km in about 30 minutes. From a standard home charging socket, an average of 48km of range is added every hour. The bigger battery pack can run for 500km on a single charge, complete 0-100kmph in 5.1 seconds and reach a top speed of 225kmph. Supercharging and standard home charging times are clocked at 270km in 30 minutes and 60km every hour respectively. Unlike other cars, the variant list is defined on the basis of the battery packs available. As mentioned above, the standard and the long-range battery packs are the two available with the Model 3. Standard equipment is identical in both the cars. The standard kit includes the massive touchscreen display, automatic emergency braking and collision avoidance system, eight airbags and voice activated controls. Premium upgrades like LED fog lamps, 12-way power adjustable front seats, tinted roof with ultraviolet and infrared protection and, auto dimming, power folding, heated ORVMs are optional extras. Like other Tesla models, the Model 3 doesn’t have any direct rivals. That said, it is similarly sized as the Mercedes-Benz C-Class, BMW 3 Series, Volvo S60, Jaguar XE and the Audi A4. The plain design, both inside and outside the cabin, of the budget-sensitive Tesla might not floor everyone. But when it comes to tasting the future, none of its competitors come close. Although self-driving capability isn’t available with the Model 3, the zero-emission powertrain and the decent travel range on a single charge is enough to make it a must consider. That’s, of course, if you can afford one!